We visited Mount Vernon, George Washington’s Virginia estate, with some friends a few weeks ago, and had a good time touring the house and gardens. I then made a beeline for the exhibition “Hoecakes and Hospitality: Cooking with Martha Washington,” which is on display at Mount Vernon’s Reynolds Museum through August 11th. This exhibition explores the work that went on behind the scenes to feed the Washingtons and their many visitors. Some of the original pots and pans and tableware are on display, as are a number of Martha’s cookbooks and recipes. 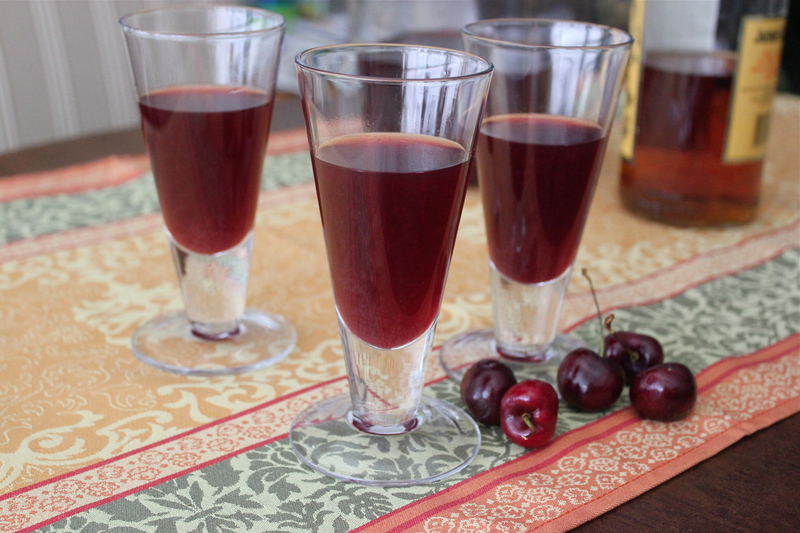 There are recipes for hoecakes (George’s favorite breakfast), sturgeon, a “ragoo” of asparagus, and Martha’s “Great Cake.” But the one that appealed to me most was for a drink called cherry bounce. Bounce is made from sour cherries, sugar, and liquor such as brandy, rum, or whiskey. Martha’s recipe, which was found in her papers although not in her handwriting, called for brandy. This drink was one of George’s favorites. He even took it along on journeys — on a trip west in 1784, in search of a commercial waterway from the Atlantic to the Mississippi Valley, he packed canteens of Madeira, port, and bounce. I wish I traveled like that! We’re flying to Rochester this weekend, but much as I’d love to bring a canteen of bounce, I seriously doubt I could get it past airport security. Extract the juice of 20 pounds well ripend Morrella cherrys. Add to this 10 quarts of old french brandy and sweeten it with White sugar to your taste. To 5 gallons of this mixture add one ounce of spice such as cinnamon, cloves and nutmegs of each an Equal quantity slightly bruis’d and a pint and half of cherry kirnels that have been gently broken in a mortar. After the liquor has fermented let it stand close-stoped for a month or six weeks then bottle it, remembering to put a lump of Loaf Sugar into each bottle. I followed a modernized version of this recipe developed by Nancy Carter Crump for the book Dining with the Washingtons. I didn’t use fresh sour cherries as they’re hard to find in New York City, and cost too much. But I found preserved Morello cherries at my local grocery store, and apparently Trader Joe’s carries them as well. Crump’s recipe calls for the cherries to be mashed and the juice strained from them; the juice is then mixed with brandy and sugar. If you want to try the old-fashioned method, leaving cherries and broken pits in for several months, see the blog The Runaway Spoon for some good instructions. I love this drink. It’s sweet but not excessively so, and the cherry flavor really comes through but doesn’t ruin the brandy. Also, we noticed that the flavor improved even after just a few weeks, so I can’t wait to taste it in another month or two. I am curious whether bounce tastes even better when made with fresh cherries — I’ll report back if I make it that way next time. Adapted from Dining with the Washingtons. I cut the quantity made in this recipe by a third. 1. Pit the cherries, cut them in half, and put them in a large bowl. (If you use jarred cherries, drain them first, setting that juice aside.) 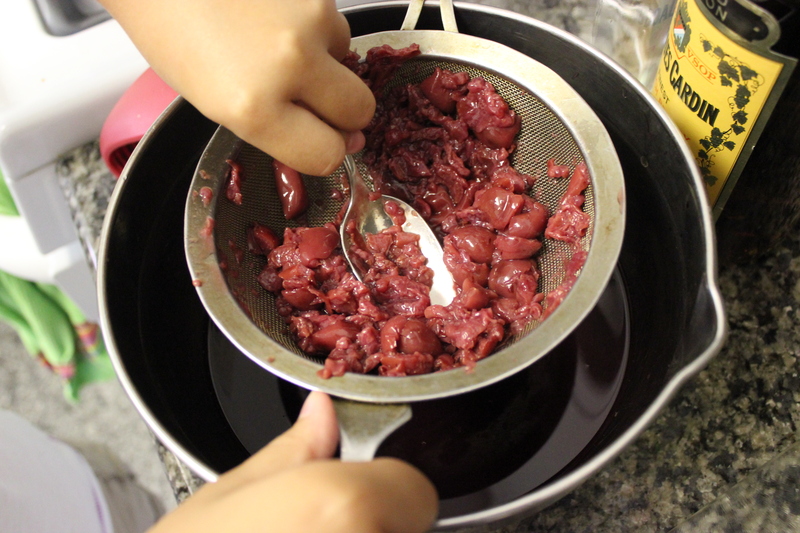 Mash the cherries with a potato or other masher to extract the juice. Then strain the juice through a fine-mesh sieve, pressing with a spoon to extract all the juice. 2. Sterilize a lidded three-quart glass jar. 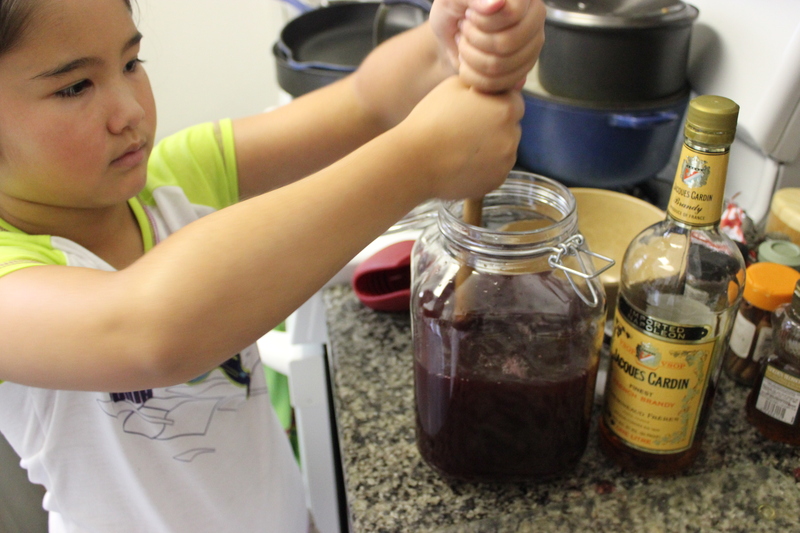 In the jar, combine the juice (including the reserved juice, if you used jarred cherries) with the brandy and sugar, stirring to dissolve the sugar (my trusty assistant did this task as well as the mashing; and no, she wasn’t allowed to drink it). Cover the jar with the lid and put in the refrigerator for 24 hours, stirring or shaking it occasionally. 3. Remove 2 cups of juice from the jar. Place in a saucepan and bring to a simmer over medium heat. Taste the juice and add more sugar if desired. (If you use preserved cherries, you probably won’t need more sugar.) Add the cinnamon sticks, cloves, and nutmeg, then cover and simmer for 5-10 minutes. Set aside to cool to room temperature. Strain the liquid, discarding the cinnamon, cloves, and nutmeg, if you’re using whole nutmeg. 5. Serve at room temperature, garnished with whole pitted cherries, if you like. Store the remaining bounce in the refrigerator. This entry was posted in beverages, drinks and tagged 18th century, brandy, cherries, Cooking, George Washington, Martha Washington, Morello cherries, Mount Vernon by revolutionarypie. Bookmark the permalink. I can heartily attest to the deliciousness of this bounce as well as the shrub from a few posts ago… thanks again Karen! Katie! Love seeing that face. 🙂 Cherry Bounce sounds delish! I loved visiting Mount Vernon. You reminded me that I got a cookbook from there and I need to pull it out and try some recipes again soon. Great blog! Thanks, Mandy. And I love your blog and your photos! Why thank you! I need more practice, but I’m having fun with it! This gives me a great idea for the one gallon of brandied sour cherries I made in July! I guess you’re already halfway there. I’m glad you wrote, as you’ve reminded me that I need/want to make some bounce again.